People with disabilities form the single largest minority group in the United States today, and yet less than 3% of grants from institutionalized philanthropy are given to programs for people with disabilities. This highlights why the International Day of Persons with Disabilities is so important for the global culture. Despite the prevalence of persons with disabilities, awareness is lacking. December 3rd was named International Day of Persons with Disabilities in 1993 as a time to raise awareness and increase cultural inclusiveness for those with disabilities. The International Day of Persons with Disabilities is about raising awareness for both visible and invisible disabilities. When most people hear the word “disability,” they think of wheelchairs. However, of the 53 million people with disabilities in the United States, just 3.3 million people over the age of 15 use wheelchairs. A disability is any physical or mental impairment that substantially limits one or more major life activities. Some disabilities might require the use of a wheelchair, cane, or crutches. Other people might have a service dog, or they might have no assistive devices at all but a significant limp or visible injury. Still others might have a disability that’s entirely invisible. Invisible disabilities are just as real, just as potentially difficult to live with, as visible ones. Each individual is different, with an entirely unique set of abilities, limitations, or needs. This is true regardless of whether a person has a visible disability, an invisible disability, or no disability at all. For people with a disability, however, living a normal life might require more work. That’s where the International Day of Persons with Disabilities comes in. It’s aimed at raising awareness so that people can find ways to make life easier for their friends, coworkers, neighbors, and family members living with disabilities. The theme for this year’s International Day of Persons with Disabilities is Sustainable Development: The Promise of Technology. The sustainable development goals (SDGs) are a set of goals developed during the 2012 United Nations Conference on Sustainable Development, focusing on environmental, economic, and social ways to improve life and welfare. The disability-inclusive SDGs, unsurprisingly, focus on making sure the SDGs are inclusive for those with disabilities. For example, one of the SDGs focuses on promoting education. The disability-inclusive aspect of this goal includes upgrading educational facilities to make sure they’re accessible for people with disabilities. This might include adding ramps or widening doorways for individuals who use a wheelchair. However, as demonstrated by the Office of Student Disability Services at Johns Hopkins University, there are lots of other ways to make disability-inclusive changes in education. Some of listed accommodations even fit under the theme of using technology in a disability-inclusive way. For example, for a student who is deaf or hard of hearing, the instructor might be required to use a microphone to produce a real-time text transcription that’s visible on the student’s computer screen. Another accommodation listed for Johns Hopkins University’s deaf or hard-of-hearing students is a visual warning system for building emergencies. This fits the second sub-theme: disaster risk reduction and emergency response. Technology designed to increase early-warning systems for disasters, as well as make evacuation, emergency response, and recovery efforts disability-accessible, is extremely important because of the disproportionate effect of disasters on those with disabilities. The mortality rate of people with disabilities going through disaster situations is up to four times higher than that of the non-disabled. There are several reasons for this. People with disabilities are more likely to be abandoned due to a lack of planning or preparation. Lots of disaster relief shelters or refugee camps aren’t accessible to people with disabilities. Additionally, people with disabilities are also often seen as in need of extensive or complex medical care, so they are more likely to be denied access to shelters or supplies. The best way to combat these issues is through careful planning. Disaster-relief plans must include ways to make sure people with disabilities have access to the same resources as everyone else. A good way to do this is to include people with disabilities in the planning process. The final sub-theme, creating enabling work environments, can also be advanced by involving people with disabilities. Similar to making other environments disability-accessible, making an accessible work environment can involve a variety of different changes, depending on the different disabilities. For example, using technology that makes it possible to stay at a desk or work at home, such as telecommunications and email, can help those with mobility issues. The best way to come up with solutions to issues in a particular work environment is to form a group and come up with ideas together, being sure to include any employees who have disabilities in the discussion. Additionally, there are lots of resources for employers who wish to create a more accessible, or enabling, work environment. For instance, the Partnership on Employment & Accessible Technology (PEAT) has a TechCheck to evaluate working environments’ accessibility, as well as a guide for employers on Accessible Technology Action Steps. The Web Accessibility initiative can help web developers make websites more disability-accessible. Honor the International Day of Persons with Disabilities by making changes in your own environment. Disability-inclusive changes take place after discussion, so start talking. 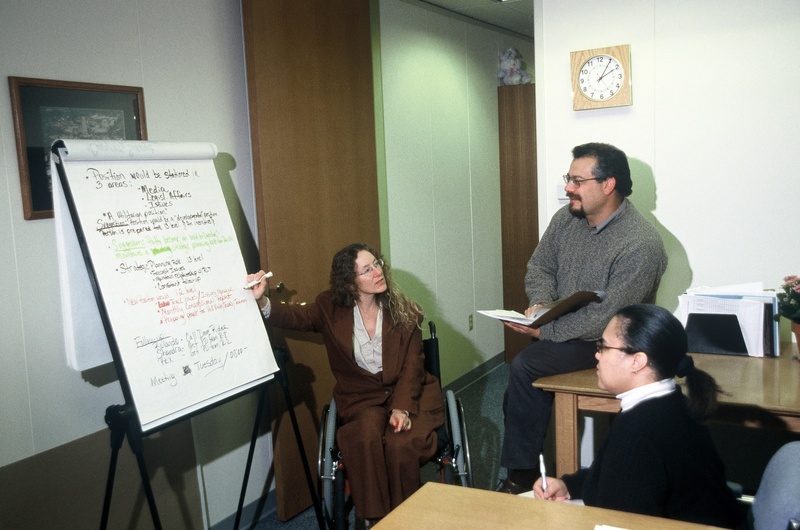 Ask your boss if you can form a brainstorming group to come up with disability-inclusive ideas. Talk to your children’s or grandchildren’s teachers about technology to help students with disabilities. Start a discussion with your neighbors about emergency preparedness plans, especially if you or any of your neighbors have disabilities. Even simple changes can make a big difference. Swap out phones and keyboards for ones with buttons that have large-print numbers and braille. Replace computer monitors with larger ones to increase readability, and look into voice-recognition software. Also, keep in mind that just because this year’s International Day of Persons with Disabilities theme center around technology, it doesn’t mean you can’t find other ways to make your environment more accessible. Grab bars, railings, ramps, and wide aisles between desks can make life much easier for those with disabilities. In addition to this, remember during bathroom renovations that pedestal sinks, as compared to sinks with cupboards underneath, allow a lot more room for people in wheelchairs. There are countless ways to make the world around you more disability-accessible. As you go through your day, consider what might be difficult if you had a disability – blindness, deafness, chronic pain or fatigue, or any other disability – and find solutions to those difficulties. How will you create disability-inclusive changes for International Day of Persons with Disabilities?